Be part of the fun! April 13 at Adams Motorsports Park! Gates open 8am, Admission $5.00 ($8.00 after 5pm). 17 and under FREE with Adult. Thursday, January 31 The Galleria at Tyler will host the 2013 Mega Mixer & Trade Show presented by the Greater Riverside Chamber of Commerce. Racing enthusiasts will want to drop by the Motosports Expo with exhibits by Stronghold Motorsports and Adams Motorsports Park for a meet and greet with seven-time AMA Supercross Champion Jeremy McGrath, 2012 Lucas Oil Off-Road Racing Series ProLite Champion RJ Anderson, and up and coming female super-star Shelby Anderson, Limited Buggy racer for Walker Evans Racing. The event will be held from 4:30pm-7:30pm with autograph signings from 5:00pm-6:00pm and admission is free to the public. Riverside is home for the Stronghold Motorsports super-team, which was founded in 2009 by its owners Scott and Beverly Bailey. Their son, Pro4 racer Brandon Bailey, manages the Stronghold team operations both on and off the track and many of the team’s off-road drivers are trained by Troy Adams, President and CEO of Adams Motorsports Park. Through excellent ownership, management and training they are equipped for every race. 2012 Lucas Oil Off Road Racing Series Season Championship awards banquet the super-team reigned on top. Stronghold Motorsports was named “Team of the Year” while ProLite Champion, RJ Anderson received “Driver of the Year” honors and Crew Chief Nick Griner was acknowledged as “Mechanic of the Year.” RJ Anderson also took home the 2012 ProLite truck championship trophy along with “Crash of the Year” which fans can recall for his efforts to take the lead from Casey Currie in the Lucas Oil Challenge Cup season finale. Also home to the Riverside area and sponsors of both Stronghold Motorsports and Adams Motorsports Park are Lucas Oil, Walker Evans Racing and KN Filters. Fans who attend the Mega Mixer and Trade Show on Thursday can “Spin the Wheel” at the Stronghold and Adams Motorsports Park exhibit for a chance to win product from sponsors, along with many other great prizes. Since 1959 Adams Motorsports Park has been the place to go for great racing action in Southern California’s Inland Empire. Adams Motorsports Park is located at 5292 24th St. Riverside, CA 92509. For more information call 951-686-3826 or visit them on the web at www.adamsmotorsportspark.com. Don’t miss the drift action this Thursday night at Adams Motorsports Park, as we celebrate St. Patty’sDay with a big Monster Bash! Representatives from Monster Energy, the official Beverage Sponsor for Adams will be in attendance with samples, swag and some Monsterous raffles. Jeremy “Twitch” Stenberg, freestyle motocross rider and professional off-road truck racer and Brandon Bailey, professional ProBuggy driver from the elite Stronghold Motorsports team, sponsored by Lucas Oil, Loctite, and Supercross.com are set to make an appearance, sign autographs and do the Monster Bash! Professional Formula D driver, Joon Maeng will also be at Adams for the second week in a row! Joon is set to do the Monster Bash in his Lucas Oil Nitto Tire S13.5, and will be giving ride alongs to a lucky few, signing autographs, and bringing some Lucas Oil giveaways for his fans! This is one Monster Bash you won’t want to miss! Sport your Monster gear and pay only $3.00 before 7pm, general admission is $5.00. Drifters, buy the first two sessions and get the third FREE, sessions are only $20.00! Adams Motorsports Park is located at 5292 24th St. Riverside, CA 92509. 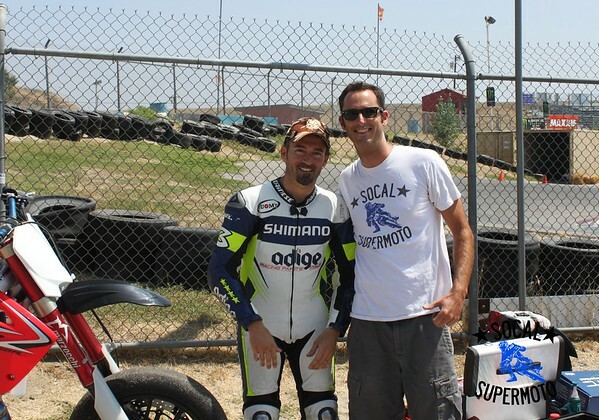 For more information call 951-686-3826.
motoGP legend Max Biaggi joined us (or did we join him?) for one of our trackday last Saturday at Adams. I’ll freely admit I was like a star struck school girl (minus the screaming), and had a great time watching him ride/taking a million photos. La Sierra Grand Prix – May 15 in Riverside – Drifting – Karting – FUN! You guys have to check out this event, it’s going to be a lot of fun! May 15, 11am – 6pm at 4204 Riverwalk Parkway (near Pierce and 91). Call 951-826-5265 for more info! Racing, drifting, car show – special races against police officers, firefighters and city officials! Sam Hubinette has started his own racing team, Samuel Hubinette Racing, given his title-winning Dodge Viper to team driver Andrew Comrie-Picard and picked up a shiny Dodge Challenger for himself. The team went out to Adam’s Motorsports Park in Riverside, California to shake everything down, and the result is a couple of orange blurs and a lot of smoke. Marco aka Sharkerio has put together a fine episode for you tonight. Highlights from the last few weeks at Adams Motorsports Park Thursday night drifting including interviews with pro drivers, D1 qualifying, great music and more!